If you are new to our area welcome. Please look at the Practice area map below to see if you fall within our area, and can join the practice. All new patients are asked to complete a patient registration form, which is available from the practice or can be downloaded here. All patients are allocated a named accountable GP at registration (all existing patients have also been allocated a named accountable GP) but this is mainly for administrative reasons. You may book appointments with any GP subject to their availability and are not limited to the named one. If you do wish to have your allocated GP changed for a particular reason - please inform the practice and we will do our best to accommodate your request. Patients moving from another NHS practice can use the following form to begin the process, and it will assist us if you can provide your NHS number if possible please. Patient Handbook - New Patients are given a copy on registering with the practice. Current patients may also request one or download one. You are welcome to have a health check on first joining the practice and to receive a health check, at your request, if you are aged between 16 and 74 and have not seen your doctor in the past three years. 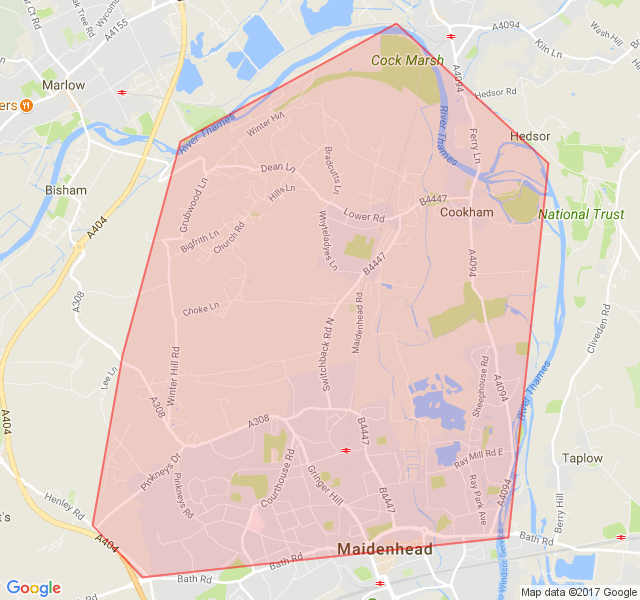 The practice inner boundary extends close to the A4 in Maidenhead and follows the river Thames from Maidenhead Bridge Quarry Wood Road/Grubwood Lane/Winter Hill Road and extends to Pinkneys Green. We operate an inner and outer boundary system. Patients who move from the inner boundary but are still within the outer boundary may remain on our list. However, patients may only register as new patients if they live within the inner boundary. Please ask at reception to see a large and detailed version of the map and to check the outer boundary. Please note the area of Hedsor is not actually within the inner boundary as this map is not exact and is only indicative of our boundary. People to Places: Offers transport to anyone living within the Royal Borough who have restricted mobility. Cookham Voluntary Services: CVS is designed to provide help with transport for the residents of the Cookhams who have difficulty in using public transport. It is run entirely by volunteers who can claim mileage for using their vehicle. Charges: Voluntary donations are welcomed - ask driver for envelope. As a guide the approximate return mileage from Cookham to local hospitals are: St Marks, Maidenhead 8 miles Wexham Park 25 miles King Edward 20 miles Wycombe 12 miles Harefield 33 miles Royal Berks (Reading) 40 miles Heatherwood 27 miles. This information has been provided by Cookham Patient Participation Group. Every effort has been made to ensure that the above information is correct at the time of printing, but we accept no responsibility for any inaccuracies. There is very limited parking at Cookham Medical Centre, so please note the car park is reserved for staff and patients attending the Medical Centre and for people using Pinder Hall. Parking spaces taken by shoppers means problems for our elderly and disabled patients. Please note that although there are no doctor appointments over lunchtime as that is when they do Home Visits, there are frequently nurse appointments taking place, so access for patients is still needed.